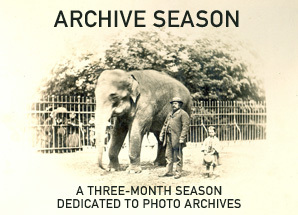 A Three Month Season Dedicated to Photography Archives. This special season will include seven new short films, extended audio interviews and a dedicated archive issue of Source Magazine. The films and interviews will be published here every week from the beginning of March. The films will range from stories of individual photographers, like the Jo Spence and the John Blakemore Archives, to specialist collections like that of London Zoo, which contains photographs of extinct animals unavailable anywhere else and local collections like the local newspaper the Newtownards Chronicle. Also featuring will be the Archive of Modern Conflict, the Royal Anthropological Institute and archive conservator Susie Clark.For collections on a global and national scale we will be speaking to the British Library Endangered Archives project, Getty Images,Magnum Photos and the National Photographic Archive. To kick off the Source Photographic Archives Season, you are invited to submit your favourite photographic image – from an online archive – to our Facebook Competition page. The editors will select their favourites from the entries to win various prizes, such as personal archive tours. Get your found archive image up by Thursday 10th May, 2012 to win. A film made at London Zoo Library and Archive. John Edwards talks about the history of taking photographs of animals and some of the unusual photographs in the collection, including pictures of animals that have become extinct. The Librarian Ann Sylph describes what the photographs are used for and the difference between illustration and photography when recording living animals. Birmingham Central Library has acquired a large part of the archive of photographer John Blakemore to add to its already extensive photographic collection. Visiting the library, Blakemore recounts his working life as a photographer and explains how this story informs the library catalogue of his work. Pete James, library Head of Photographs, describes his ambitions for the photography archive while other library staff describe how Blakemore’s work fits into the broader holdings of the library. The Chronicle is a weekly Northern Irish newspaper that serves the town of Newtownards and its surrounding area. The Chronicle has an archive of photographic negatives that date back to the 1930s. Photographers Bob Torrens and Jonathan Coates give a guided tour of the newspaper’s offices, talk about their role taking photographs for the paper and the challenges of finding old negatives and preserving their archive for posterity. Terry Dennett, former partner of the artist Jo Spence (1934-1992) and curator of the Jo Spence Memorial Archive talks about Spence’s life and work. In Dennett’s flat, where the archive has been stored, the work has been boxed, ready to be sent to Ryerson University in Canada where it will join the university collection. He shows examples of her working albums, daybooks from her portrait studio, posters and magazines that she produced and books and ephemera from her library. Concealed within a west London house is a huge archive, largely made up of vernacular photographs but also including all manner of other unexpected objects with stories behind them. Timothy Prus and Edwin Jones explain the origin of the collection and pick out some randomly selected examples to give an impression of the extraordinary range of images the collection contains, from Polish airplane manufacture and Victorian microscope slides to Indian film posters. An interview with the paper and photographic conservator Susie Clark. She shows some examples of the materials she encounters in archives and the situations that typically cause the deterioration of photographs and negatives. Most major archives have now been visited by a conservator and few now believe that digitization will replace the originals that archives preserve. Chris Pinney, author of Anthropology and Photography, recounts some of the early history of anthropologists taking photographs and the place of those photographs today in the Royal Anthropological Institute Photography Archive. Sarah Walpole, Archivist and Photo Curator at the Institute explains the challenge of organizing such a large and diverse collection that contains anything from photographs of skulls to Japanese village life. Magnum Photos is an internationally renowned photographers’ agency with a huge collection of photographs. Technological changes mean pictures are now dealt with entirely digitally. What then are the implications for Magnum’s archive of photographic prints? Sophie Wright and Fiona Rogers run the cultural office at Magnum Photos in London and Source spoke to them both about how Magnum had dealt with this question. The London branch of Magnum was set up more recently than the New York and Paris offices and so has a smaller legacy of photographic prints to deal with, although a quantity of material was inherited from the agent John Hillelson who had previously represented Magnum in the UK. In New York, the eventual solution was to sell the greater part of their print archive to Michael Dell, who gave it to the University of Texas. In Paris they are trying to establish a foundation to look after their archive. In London, when the print collection ceased to be a working tool, it was ‘decommissioned’. Magnum is a commercial organisation which continues to represent the interests of its member photographers. Although currently in a state of transition, the Magnum archive seems better placed than most to deal with this legacy of the analogue era. Magnum haven’t simply thrown away prints just because they don’t use them. The question, is whether they can find someone to give them a permanent home. Getty Images is well known, with Corbis, as one of the dominant commercial picture libraries. Most people would encounter it through its website but behind the website is a physical archive in North London. We went to meet curator Sarah McDonald to find out about the collection. The entire collection represents an accumulation of historical collections from the London Stereoscopic Company to the Daily Express archive, and it’s still growing. These individual collections are themselves so large that they each maintain their original organisation and catalogues; there is too much material to impose a new structure on them. A researcher looking for a picture in the Evening Standard collection will be using the catalogue originally devised when it was a part of that newspaper. The negative collection contains images that may never have been seen or even unpacked from their wrappers, and this includes images made in the 19th century. The Hulton archive (that was the basis of the collection) included Picture Post. We were shown a daybook that records the different picture stories shot by Picture Post photographers during a week. On facing pages are the stories that were published and the ‘killed’ stories that were never used and may never have been printed. They are in the business of finding new uses for old pictures, a nice example of this being the sudden attraction of stereoscopic photographs to 3D TV and film makers. If you can keep everything then eventually someone might come along with a need for even your most obscure pictures. Elizabeth Kirwan is the current curator of the National Photographic Archive which opened in 1998. When it opened the Archive consisted of a new building – designed by O’Donnell and Tuomy – into which the existing collection of the National Library (of which it is a part) was moved. A new catalogue, reviewed in Source at the time, was produced for the opening. Justin Carville in his review said that the archive should be clearer about their acquisitions policy and collect more contemporary photographers. Since it opened the Archive has undergone a few quiet changes. It has taken an active policy of digitizing its collections and putting them on Flickr. It has acquired a number of collections, notably the Irish Independent Archive. And it has closed, only to re-open nine months later having received a stay of execution from a new board of governors for the Library. Kirwan and her small staff are now undertaking a stock take which will form the basis of an argument that the Archive should continue to exist. The necessity of this stock take is made apparent when, incredibly, she says that they have discovered the Irish Independent Archive (still described on their website as 300,000 negatives) consists of roughly four million more images than they originally thought. Now, more than ever in its short life, the Archive needs allies who support the idea of a national collection of photography in Ireland. Small amounts of public funding can make an enormous difference to a photographer. But there are some objectives like, for example, ‘safeguarding the documentary heritage of humankind’ that require more substantial backing. The Endangered Archives Programme at the British Library received $18.2 million from a charity called Arcadia to work towards this ambitious goal and, since 2004, have been spending this money to preserve and digitize all manner of precariously situated collections around the world. The British Library (motto: ‘the world’s knowledge’) is the perfect place for such a project having in-house expertise in many different cultures and languages as well as experience in archiving and digitizing documents of all kinds (Arcadia also fund the excellent National Sound Archive). We went to speak to Lynda Barraclough, the curator of the programme, and she explained how individual projects are selected and administered. Projects funded so far that are exclusively photographic include, amongst others, photographs from the Georgian State Archive, a photographic archive of Siberian indigenous peoples and a Cameroonian photographic studio. The last of these projects is run by social anthropologist David Zeitlyn. David has been working in one village in Cameroon for more than 25 years. He says he stumbled into photography by chance when he tracked down the two photographers who made the village’s identity photographs, Samuel Finlak and Joseph Chila. David subsequently organised an exhibition of their work at the National Portrait Gallery in London based on what remained of their archives. Only later did he meet the photographer that had taught them, Jacques Touselle. ‘Photo Jacques’ had retained much more of his work and this prompted an application to the Endangered Archives Programme.